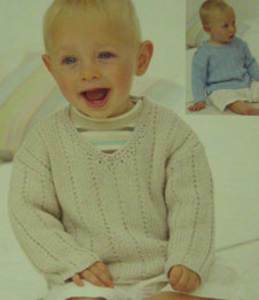 Cable sweater with collar or V-neck, and slipover to fit sizes 41-66cm (16-26ins). 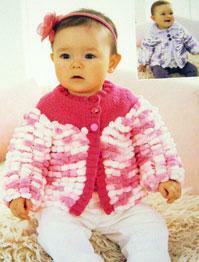 Cardigan to fit sizes 41-56cm (16-22in) ages 0-3 years. 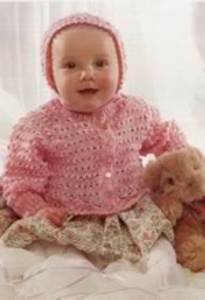 Knitted in Patons 4 ply yarn. 40st / 36 rows to 10cm on 3.75mm needles. 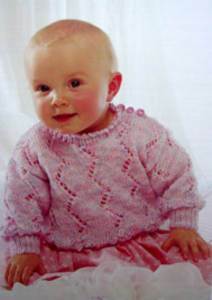 Embroidered top knitted in 4ply, to fit 0 to 7yrs, 41-66cm (16-26in). 28st / 36 rows to 10cm, 3.25mm needles. 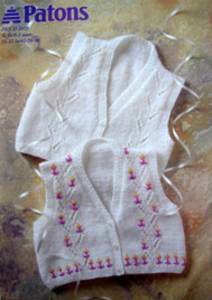 Waistcoat with optional embroidery. 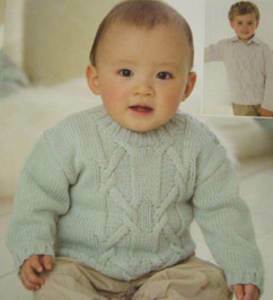 Knitted in 4ply, to fit 0-3yrs, 41-56cm (16-22in). 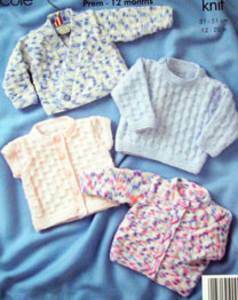 Jacket, sweater and cardigan in simple lace st panels or trimmed in King Cole Sprinkles yarn. 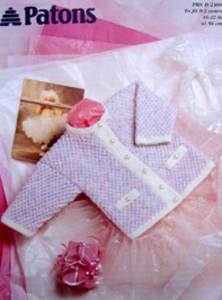 Includes premature size 31-61cm (12-24in). 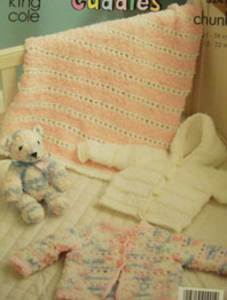 Cardigan with curved edge and picot trim, plus hooded jacket and pram cover in King Cole Cuddles chunky snowflake yarn with aran eyelet stripes. Includes premature size, 31-56cm (12-22in). 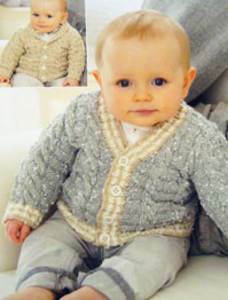 Embroidered cardigan, knitted in DK, to fit 0-3yrs, 41-56cm (16-22in). 21st/32 rows to 10cm over pattern, 4mm needles. 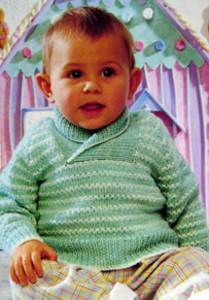 Raglan cardigan in DK yarn, fits 0-7 years, 41-66cm (16-26in). Tension 22st / 30 rows to 10cm, 4mm needles. 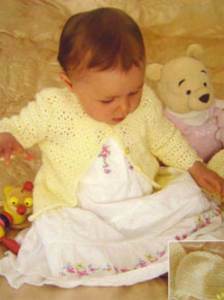 Lacy cardigan and bonnet to fit 0-3 years, knitted in DK yarn 41-56cm (16-22in). 22st / 30 rows to 10cm on 4mm needles. 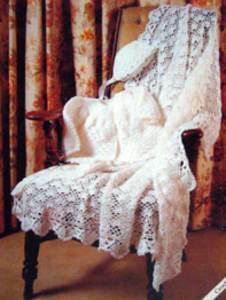 Matinee coat, bonnet bootees and mitts featuring lace work. 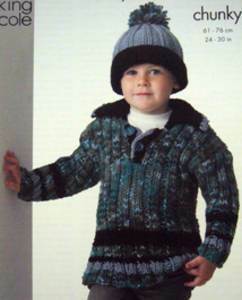 Coat has raglan shaping Knitted in 4ply, 28st/36 rows to 10cm, 3.25mm needles. 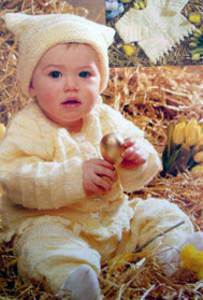 One size to fit 0-9mths, 46cm (18in). Raglan sweater with lace panels in DK. To fit 36-51cm (14-20in). 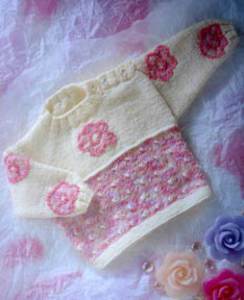 Flowerbud pattern sweater with textured stitch enhanced by embroidery. To fit sizes 41-66cm (16-28 ins). IN DK, 23sts/31rows to 10cm, 3.75 mm needles. 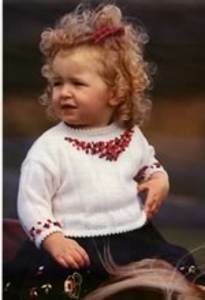 Sweater with cable ribbing and motifs, knitted in DK. 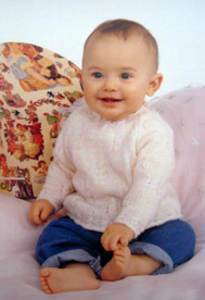 To fit 0-3yrs, 41-56cm (16-22in). 22st/30 rows to 10cm, 4mm needles. 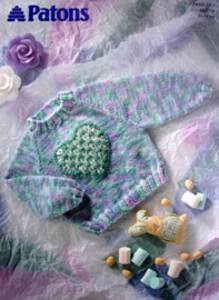 Sweater knitted in DK, with textured heart panel. To fit 41-56cm (16-22in). 22st/30 rows to 10cm, 4mm needles. 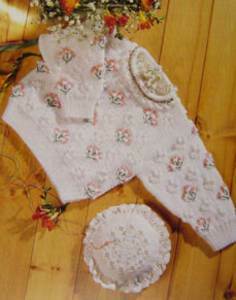 Sweater to fit sizes 41-56cm (16-22in) ages 0-3 years with flower motif. Knitted in DK, 22st/30 rows to 10cm, 4mm needles. 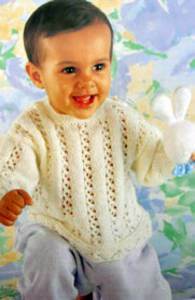 Eyelet sweater with picot neckline, to fit 0-7yrs, 41-66cm, (16-26in). 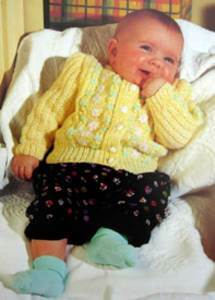 Knitted in DK, 22st/30 rows to 10cm, 4mm needles. Sweater with button up shoulder or V neck in easy broken rib. 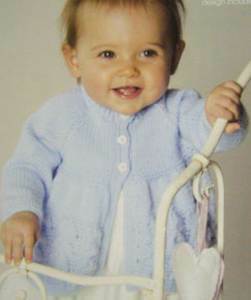 To fit babies and children 0 - 7yrs, 41-66cm (16-26in). 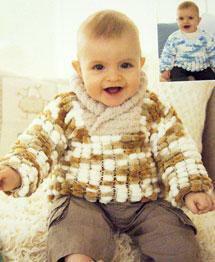 Round or V neck sweater with cable panel fits babies and children 0 - 7yrs, 46-66cm (16-26in). 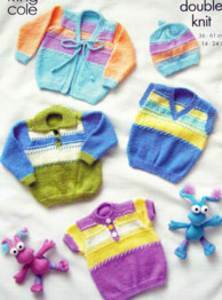 Shown in Sirdar Baby Bamboo DK. 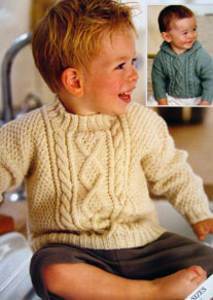 Cable sweater with hood or round neck in DK yarn to fit sizes 41-66cm (16-26 ins). Tension: 22sts/28 rows to 10cm over moss st, 4mm needles. 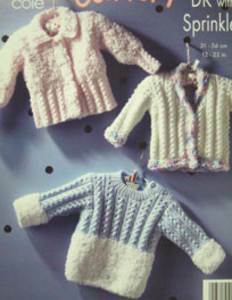 Sweater in easy garter st and stocking st ridge st, plus round neck cardigan and V neck short sleeve cardigan with ridge st borders. From King Cole, to fit 36-61cm (14-24in). 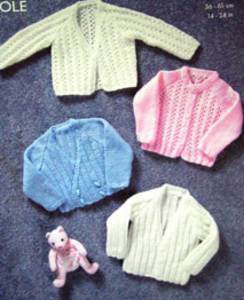 Double breasted, v and round neck cardigans in lacy or 'mistake' rib. To fit sizes 31-61cm (14-24ins). Long and short sleeve and crossover cardigan plus sweater, all in textured basketweave st with garter st edging, shown in King Cole Comfort DK. 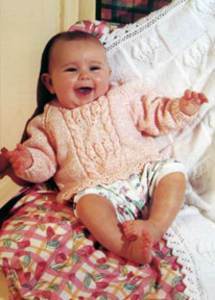 Includes premature size 0-12mths, 31-51cm (12 -20in). 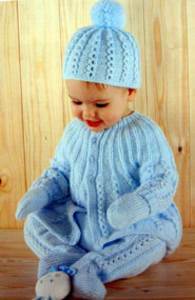 This crochet layette includes a dress, hat, bootees and shawl, and is worked in DK yarn. To fit sizes 41-56cm (16-22in). 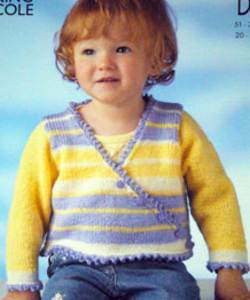 Easy raglan cardigan with single button and round neck can be knitted in two lengths. 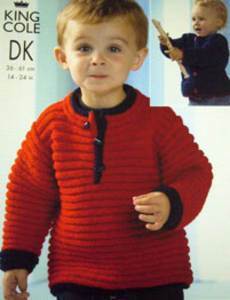 Shown in Sirdar Tiny Tots DK, to fit 0 - 7yrs, 41-66cm (16-26in). 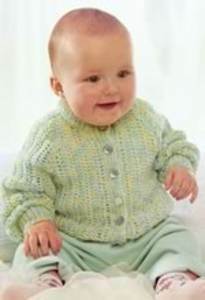 Raglan sleeve, curved edge cardigan with button and loop fastening, shown in Sirdar Snuggly Kisses DK. 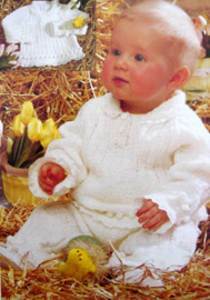 To fit babies and children 0-7yrs 41-66cm (16-26in). Easy V neck cardigan with long or short raglan sleeves and flared peplum. 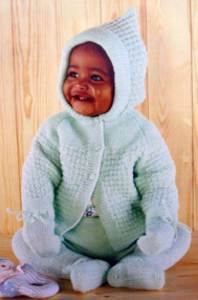 Shown in Sirdar Snuggly Kisses DK, to fit babies and children 0-7yrs 41-66cm (16-26in). 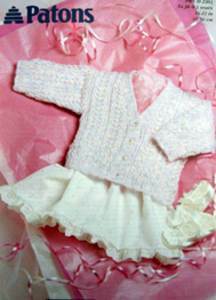 Cardigan with shawl collar or V neck and optional contrast borders with cables on a textured background of garter st and stocking st stripes. 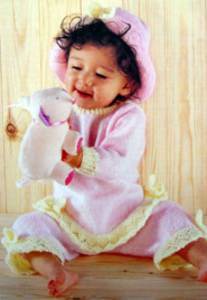 Shown in Sirdar Tiny Tots DK, to fit 0 - 7yrs, 41-66cm (16-26in). 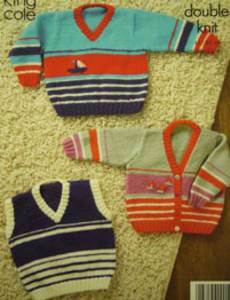 Stripy V neck sweater with swiss darned boat, cardigan with embroidered flowers and slipover from King Cole. 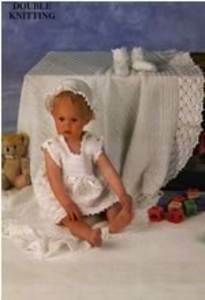 To fit from 3mths to 4yrs, 41-61cm (16-24in). 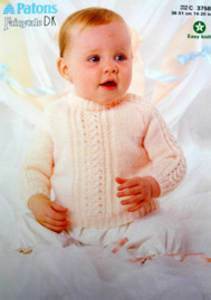 Sweater with collar has long or short set-in sleeves, plus cardigan, V-neck slipover and hat, all with colour contrasts and embroidered detail, shown in King Cole Comfort DK. 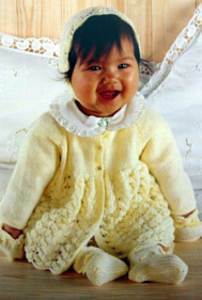 To fit 0-3yrs, 36-61cm (14-24in). Coat with flared cuffs, contrast garter st collar and edging and flower detail, plus broad rib sweater with contrasting collar and button tab, and bobble hat, from King Cole. To fit 61-76cm (24-30in). Crossover cardigan with picot edging, zipped hooded cardigan and sweater with stand-up collar all featuring stripes, from King Cole. To fit 51-71cm (20-28in). 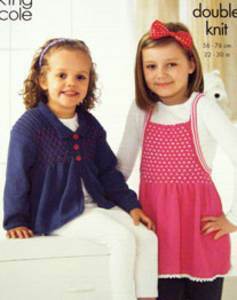 Sweet cardigan with smock st yoke and collar and trendy pinafore with smock st bib and picot trim, shown in King Cole Bamboo Cotton DK. 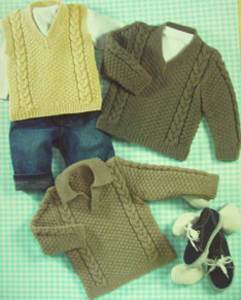 To fit age 2-10yrs, 56-76cm (22-30in). 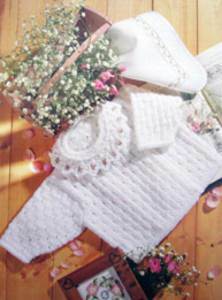 Crochet shawl, matinee coat and bonnet from Wendy in 4 ply yarn, includes premature size, 31-51cm (12-20in). .
Wendy 1023, crochet cardigan and bonnet in simple double and treble crochet to fit 46-51cm (18-20in). DK tension 18st to 10cm over pattern. 3.5mm and 4mm crochet hook. 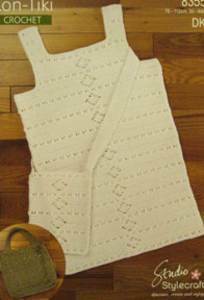 Sleeveless crochet tunic with diamond panel, shoulder bag and shopper bag, in cotton blend DK. To fit 76-112cm (30-44in). 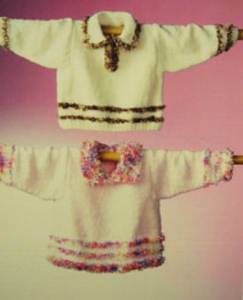 Sweater with collar, with front tab or back buttons, trimmed with fur effect fashion yarn - shown in Peter Pan Velvet Touch DK and Wendy Shimmer. To fit 41-56cm (16-22in).